475 Overlook Court Warrens, WI. | MLS# 1526998 | Clearview Realty in Hatfield Wisconsin. Helping Hunters, Families, and ATV'ers list or buy property for 15 years. Serving both Wisconsin & Minnesota. This cozy cabin in the subdivision adjoining Jellystone Park is currently being used as a duplex, but could be a single family home. 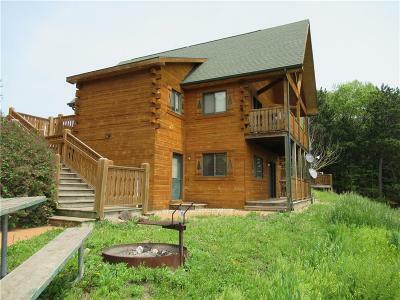 Upper level feature vaulted ceilings, 3 bedrooms, 2 full baths, kitchen, dining and living room as well as a covered wood deck. Main Level Unit includes 2 bedrooms, 1 full bath, kitchen, dining and living room as well as a covered patio. Connecting hall way has a stack washer and dryer. Property is close to recreational area in Jellystone Park. Fully furnished, including appliances. Great hillside view. Call today for a tour!